Hip hop is a unique music genre – it can’t be defined or described as easily as pop, for instance, as there are numerous performers who are improving it and redefining it up to date. That, however, is all the more reason why you need a good set of headphones to experience what these performers wanted to show us. Let’s start off with Sony’s MDRXB650BT – a remarkable bass-heavy set of Bluetooth headphones. This model features NFC connectivity, exceptionally accentuated bass, and 30 hours of total battery lifetime. It also features a built-in microphone which makes answering the calls easier. On top of that, the ear pads are cushioned, providing as much comfort as possible. They look modern and have an exquisite sound signature. First of all, Sony’s MDRXB650BT is a plain headphone set. There are no confusing features which would make them hard to use, but what really makes them ideal for hip hop is the enhanced, heavily accentuated bass. They also come in three color options, if black is not your favourite one. Sony’s MDRXB650BT is a bit bulky, so expect some fatigue to come your way after extended use. That’s the only flaw these headphones have. Generally, Sony’s MDRXB650BT offers great sound quality, plenty of bass, and excellent response. They’re not overly expensive, although they don’t come cheap either – all things considered, they’re well worth the buck. Next up is TaoTronics Active noise cancelling headphone set. Looking good, feeling good – these headphones excel in aesthetics, but that’s not the only sphere of performance where they’re good at. Namely, the active noise cancellation keeps the unwanted sound away, and you’ll be content to hear that you can use them for up to 30 hours on a single charge. The dual 40mm drivers provide unparalleled sound quality and deep, strong bass, and to top it all, the ear cups are adjustable and very comfortable to use. Active noise cancellation paired with dual 40mm drivers mean one thing – you’ll get to hear every beat, kick, and scratch in all of your favourite tracks. What’s more, they’re decently inexpensive. 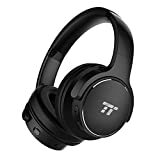 The only problem with TaoTronics Active noise cancelling headphone set is the connectivity – they seem to not be working with iPhones or Mac computers so good. As far as headphones under $100 are concerned, TaoTronics Active noise cancelling headphone set is well worth the money. The sound is excellent and the noise cancelling is simply beautiful. We recommend it not only to people who’re on a tight budget, but to every hip hop fan who wants a good bass with a balanced midstage. The last over-ear headphones in this review are Bluedio’s T3 Extra bass Bluetooth headphones. As far as aesthetics are at stake, you’ll need to search far and wide for a better-looking model. They feature 57mm drivers which offer dynamic, full-spectrum sound, as well as a tremendous bass response. To top it all, these headphones come outfitted with soft foam muffs which negate some of the ambient noise while keeping you comfortable at all times. The design of these headphones is foldable, which makes them compact and easily transportable. Apart from looking amazing, these headphones sound like a beast. They’re also packing some serious firepower – the 57mm drivers are bigger and more powerful than most which are outfitted to some of more expensive models. In truth, Bluedio’s T3 headphones are quite cheap, but they’re also built from flimsy materials. Invest extra care when you use them or they might not last you for long. These headphones have “superb” written all over. They’re not even remotely expensive and pack quite a punch for the buck, although the flimsiness might make the slightly less desirable than some of our previous picks. We’re closing the curtain with Betron’s YSM1000 headphones. Even though this is an underdog brand, you don’t need to fret about a single thing – these earphones are remarkably cheap, offer deep bass response, and, generally, they’re perfect for hip hop. The sound signature of these headphones is characterized with heavy, accentuated bass, but the overall stereo sound is quite balanced, meaning that all aspects of the soundstage are present. These headphones feature an in-ear design and isolate most of the ambient sound. Generally, the best thing about these headphones is the price – they’re among the cheapest, yet quality headphones you’ll find for hip hop, no matter how hard you try. The sound isolation they offer is pretty cool, and the bass-heavy sound signature makes them ideal for this kind of music. 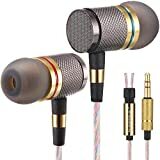 In essence, cheap headphones can’t compare with more expensive models in terms of performance – the sound stage is balanced, but the quality of sound you’ll get from these in-ear headphones isn’t exactly perfect. Great headphones if you’re on a tight budget, otherwise most people would dub them as “mediocre”. Regardless, they’re perfect for hip hop music, given that they promise high-quality bass response and much detail in sound. Sound signature: While casual listeners (regardless of the genre) prefer neutral signature, hip hop, as well as rap lovers need just a bit more bass over the top. The heavily accentuated rhythm in this music genre is meant to be enjoyed with higher lows, and that’s exactly what you’re going to get if you try out some of the headphones we recommended in the sections below. Food for thought – neutral signature headphones don’t “lack” anything per se, but certain songs might appear bland without the extra bass topping. Design: Aesthetics are important here – you want your headphones to complement your style, not the other way around. Good looking headphones aren’t exactly “demanded” in the hip hop culture, but if you already have the opportunity, why not pick a set that looks awesome while you’re at it? If you are indeed looking for the best phones for hip hop music which excel in aesthetics, you’ve come to the right place. Sony’s MDRXB650BT looks amazing, but TaoTronics Active Noise Cancelling headphones don’t lag too far behind either. 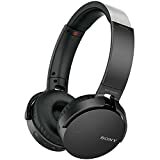 If, on the other hand, earbuds suit you more, we recommend Sony’s Extra Bass Bluetooth headphones – these earbuds boast excellent sound quality and don’t even cost too much. Headphones or Earphones: The question “are headphones or earphones better for hip hop” is quite old. In fact, a correct answer doesn’t exist up to date, but if we’re to reform it as “do we value convenience or performance more”, we’d be closer to finding it. Headphones are generally bulky, but they look awesome and usually provide better noise isolation. What’s more, headphones feature a larger body which is capable of storing more features, but exceptions on the other end are possible as well. Earphones are definitely more convenient – they are lighter than headphones and in most cases you won’t even feel them. However, they tend to bring the problem of tangy cables as well. It falls up to you to decide which type suits you better, but for sake of diversity, we’ve added a few models of each type in our review. Price: If someone told you that “best headphones for this kind of music cost a ton”, dismiss it this instant. There are, of course, excellent models that belong to the boutique level price point category, but there are also more affordable options that could bring you an exquisite listening experience. Hip hop fans, we hope that we helped you out with our review. Sony’s headphones and earbuds are generally your best option, but don’t feel shy to rely on underdog brands such as Bluedio – their headphones are capable of going toe to toe with the industrial-leading giants such as Audio Technica or TaoTronics. We wish you luck in finding the best headphones for hip hop! I’ve tried expanding my music preferences, but I really just don’t find myself listening to anything other than hip-hop. I wouldn’t mind finding a pair of headphones best suited for this type of music. The bass is really important to me and not every pair of headphones I’ve tried can deliver in that department. Thanks for putting together this list. I’ve been using Skullcandy my whole life, but I think it’s time to try Sony’s.